After Retiring As Manager of JPB’s Softbank Hawks, Japan’s Home Run King Vows to Cultivate Young Baseball Talent as Team’s Chairman. 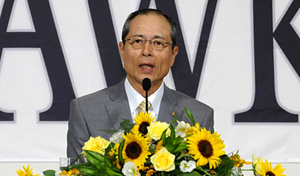 After more than two decades of dominating Japanese baseball pitchers like a man playing among boys, Honorary 500 Home Run Club® member Sadaharu Oh retired to pursue a different challenge – coaching in Japan’s Nippon Professional Baseball Association. Now he is stepping away from that role to serve as an ambassador for Asian baseball. After serving as Yomiuri Giants’ manager for five years from 1984-89, guiding the (Daiei) Softbank Hawks to the Japan Series title in 1999 and 2003, and shocking the baseball work by leading Japan to the championship of the inaugural World Baseball Classic in 2006, the man known as “The Japanese Babe Ruth” has retired from active duty to become the Chairman of his beloved Softbank Hawks. In his new role, Oh will apply his vast baseball influence for the betterment of the sport and to encourage young people to pursue their baseball dreams. “I want to create more opportunities for young people to play baseball,” he said. “If there are young players who request out support in helping them fulfill their dream of playing baseball, I'll try to meet their needs as chairman of the Softbank Hawks,” he added. Many fans of professional baseball outside the U.S. (especially in Japan) contend that the all-time home run leader is not Barry Bonds or even Henry Aaron. Statistically speaking, the man who has hit the most career long balls is Oh, who hit 868 home runs over 22 seasons with the Yomiuri Giants. Detractors point out that Oh played in smaller stadiums and faced inferior pitching compared to his U.S. counterparts. But the fact remains that “The Japanese Babe Ruth” dominated Japanese baseball in home runs, batting average, RBIs and other vital categories – for two decades. In his playing days, Oh was part of a powerful batting duo with Yomiuri third baseman Shigeo Nagashima. Known as the O.N. 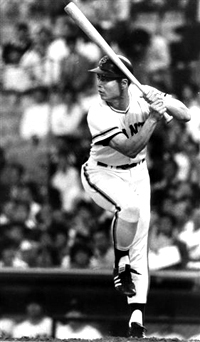 Cannon, the two players helped the Giants to nine straight Japan Series championships between 1965-73. The son of a Chinese father and a Japanese mother; Oh holds Republic of China citizenship. He is also known in Taiwan as Wang Chen-chih.